This post is for a blog competition. Digestive biscuits are very popular in Sweden, and often served as part of a cheese course. Göteborgs Kex has just launched a smaller version of these, called Små Digestive. They're cute - I usually find the regular Digestive biscuits to be a bit big, so this is welcome news for me! Bloggers were asked to make a few combinations with biscuits and cheese, and here are my three ideas. Chèvre are one of my favorites, and I knew it went super well with both pears and honey, so I decided to make a compote combining the two. This was my favorite combination! Per loves gruyère, so I knew I wanted to use that. It goes well with something sweet, yet tangy, so I made some vanilla caramelized kumquats. Very successful as well! It's like a very luxurious cheese and marmalade sandwich. Finally, my mom's favorite cheese, St Agur. It's a very flavorful and creamy blue cheese, and it paired perfectly with a caramelized walnut. It's almost slightly smokey in flavor. 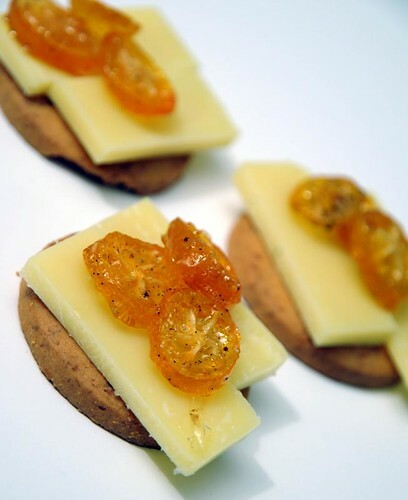 Place a slice of gruyère on each mini digestive biscuit, and top with a few kumquat slices. Slice the kumquats and remove all seeds. Mix sugar and water (and scraped out vanilla seeds, if using) in a saucepan and bring to a boil. Add the kumquats and cook for five minutes. Remove from heat and let cool slightly - then move the slices to a teflon baking sheet and separate them. Leave to cool completely. 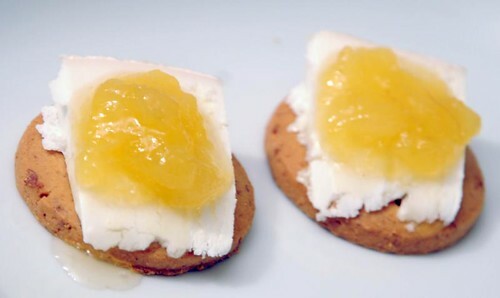 Place a small slice of chèvre cheese on a mini digestive biscuits, and top with a spoonful of compote. Peel and core the pears, and cut into smaller pieces. Place in a saucepan with the honey and bring to a boil. Lower the heat and simmer for five minutes, then check to see if the pears are soft. If they're not, let them boil for five more minutes. When they're soft, use a balloon whisk to break them up and combine the pears and honey into a coarse compote. Leave to cool. 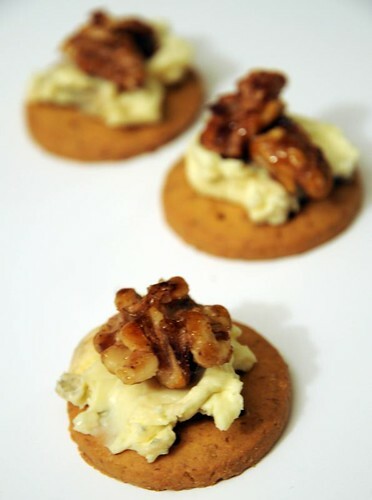 Top a mini Digestive with St Agur, or another soft blue cheese, and a caramelized walnut. Heat the oil in a small frying pan and toast the walnuts for a few minutes, until golden and fragrant. Add the sugar and salt, and stir. Cook for a few minutes, until the sugar has melted and caramelized. Pour onto a teflon baking sheet and separate while they're still hot. Leave to cool completely. Hej Anne. These are lovely. I am constantly in search of the perfect cheese plate, including those of my own making. Will add your creations to my list of wonderful must-trys! Could you give a little more background on what exactly a "digestive" biscuit is? Are they sweet or savory? I think I've seen similar cookies in Argentina but I'm not sure if they are the same things and we don't have anything by that name in the US. PS...I know that the word "biscuit" can mean "cookie" in other parts of the world but in the US it is considered a savory breadproduct and is thick, buttery & fluffy. They are often served at breakfast with eggs and meat (sausage or bacon, for instance), and are most common in the southern part of the country. Digestives are also quite popular in Scotland. Every bed and breakfast I went to had them! Your ideas are PERFECT. I want to try all of them. Such great combos! p.s- because I am so interested in Swedish, would "små" rhyme with the English "snow"? Erica - it's really quite sweet, but it's not sold as a cookie, but as a cracker or biscuit. I think American graham crackers are similar, but perhaps even sweeter? I wrote biscuit, but I could perhaps have written cracker instead - in Swedish it's "kex" rather than "kaka" - cracker rather than cookie :) Digestive are also what's usually used in cheesecake crusts here in Sweden! Bluesatinsashes - not exactly, but fairly close! In some dialects, definitely. It's a longer sound than the o in snow - with the lips even more rounded? They all look very yummy! I like your simple honey-pear compote. will try it very soon for my picky 21 months old. Det ser mumsigt ut, kanske också gott med Brieost, honung och pinjenötter? Ska absolut prova din 'Getost med päronkompott'! Oh - these all look good. Some of my favourite flavour combinations. Must try. Best of luck on the blog competition! Haha! I agree! They're really cute... and I believe they're tasty. Haven't tried Digestive biscuits, though. Varför gick jag in o kollade här!!! I love your topping combinations - they all sound lovely!